"I developed a painful blood clot in my leg. There was a tender lump under my skin, it was red and warm. I was worried that this might be dangerous"
Superficial thrombophlebitis simply means blood clotting and inflammation in the superficial veins. This is a common inflammatory disorder of veins in the legs. This condition is NOT the same as deep vein thrombosis, where clotting takes place within the DEEP veins and not the superficial veins, and often there is no inflammation. DVT is always a serious medical condition and requires medical intervention. Superficial thrombophlebitis is much less serious, but often causes a great deal of distress due to the pain and fact that the patient has a "blood clot in the leg"
Superficial thrombophlebtis can happen in any of the superficial veins in the body. We are more concerned about the veins in the legs. Any healthy or diseased vein can be affected under the right circumstances. Varicose veins are obviously more prone to this condition. Thrombophlebitis is a benign and self limiting condition in most instances. Where the greater saphenous vein is involved, the clotting might extend into the deep vein, which would pose a more serious risk. Superficial thrombophlebitis is diagnosed by a doctor on clinical grounds. Examination of the area would reveal tender superficial veins, redness, warm and slight swelling. Further investigation with duplex ultrasound might be undertaken to asertain the extent of the thrombosis or clotting. Superficial thrombophlebitis can occur spontaneously, especially in the greater saphenous vein in the legs. Although the etiology is frequently obscure, superficial venous thrombosis is most often associated with one of the following : vein injury(which can result from trauma, infection, or inflammation), stagnant or turbulent bloodflow(often found in varicose veins), or changes in blood constituents (dehydration for instance lowers the water content of blood, making it more prone to clotting). Complications are an uncommon feature of superficial thrombophlebtis. However the following can happen - extension of the clot into the deep vein, with resultant deep vein thrombosis and possible pulmonary embolism. Conversion into a infected form of phlebitis known as septic thrombophlebitis. After the acute episode hyperpigmentation of the skin can persist. Also a persistent firm nodule under the skin. The treatment of superficial thrombophlebitis depends on the cause, extent, and symptoms. 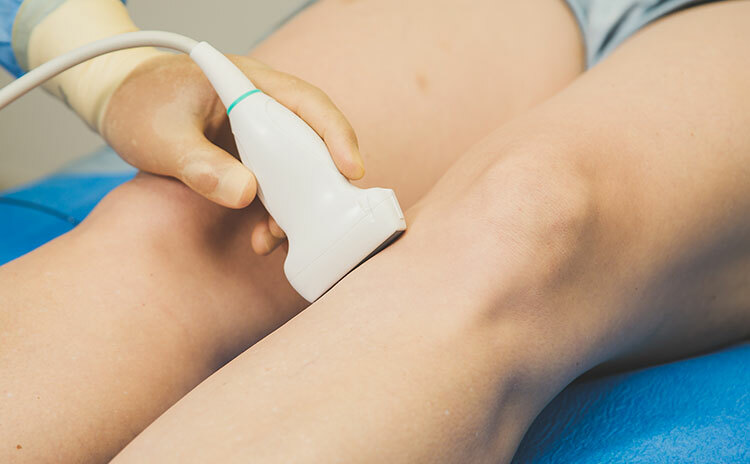 Ultrasound scanning gives an accurate assesment of the extent of the disease and thus allows the administration of a tailored therapy. For the superficial, localized, mildly tender area of thrombophlebitis that occurs in a varicose vein, treatment with mild analgesics, such as aspirin or ibuprofen, and the use of some type of support bandage or stocking is usually sufficient. Patients are encouraged to continue their normal daily activities. If extensive varicose veins are present or if symptoms persist despite treatment, then a minor procedure such as a phlebectomy of the involved vein may be indicated. More severe thrombophlebitis, usually indicated by more severe pain, redness, and more extensive vein area involved , should be treated with elevation of the leg and application of large, hot, wet compresses. It is always best to consult a doctor regarding diagnosis and treatment. 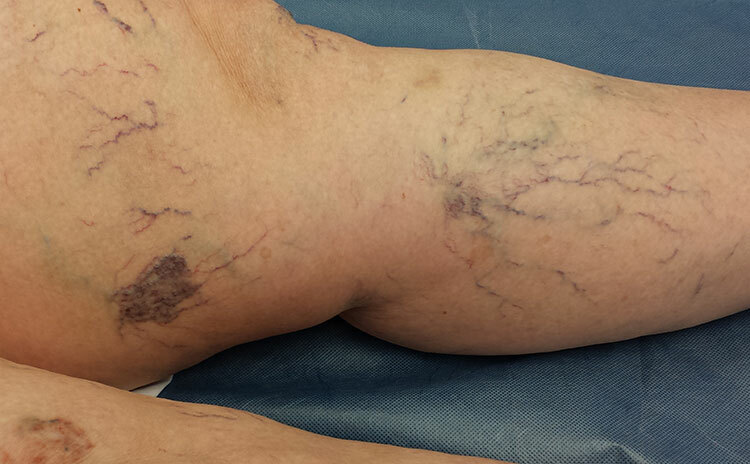 Thrombophlebitis is a known complication of varicose veins. Treatment of varicose veins would minimize your risk of suffering thrombophlebitis.